I met up with new kayak dive buddies today - Gus and his son Brian. We met at the Avenida De La Playa boat launch at 0800. Set up the kayaks and paddled out to the dive site. While still at the shore we observed that the Pelicans were diving for fish near shore and there was a harbor seal playing in the practically non-existent surf. Started off a gray day but that is good. Cool for paddling. On the way out we observed the large pod of Dolphins I have been seeing lately. (I am going to imagine they are the same ones I have been seeing.) 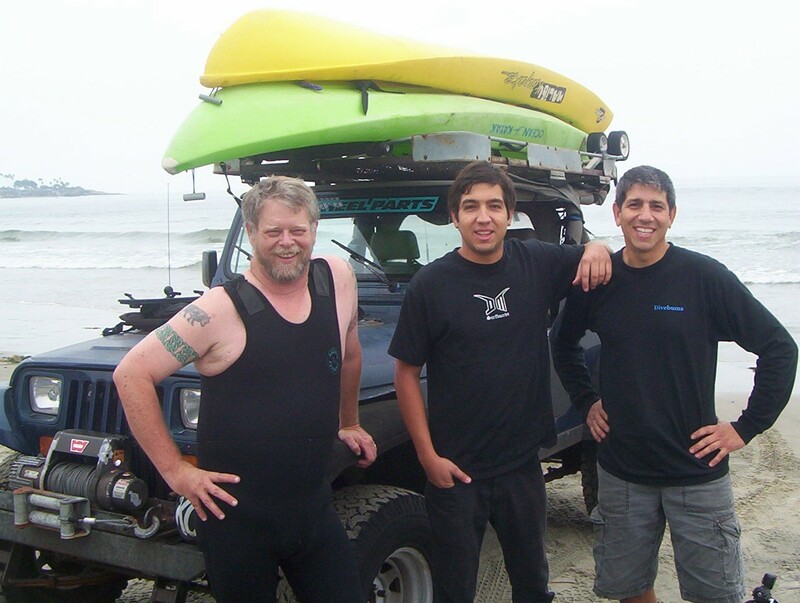 We met up with a returning kayak fisherman who had landed a two foot Humbolt Squid. We hope to see one. We anchored our kayaks and got in our gear. The surface water is a nice watery chocolate brown from the Red Tide. So the descent was dark with no visibility. About 30 feet you could feel the thermocline and the water temp dropped to about 55. Then the vis opened up to about 20 feet. We explored all around Anchor Rock. All regular reef inhabitants. I saw at least one yellow Treefish. Upon ducking under the water we could hear the Dolphins pinging their sonar. They must have been all around us. But they rarely come close to scuba divers. They were probably just out of visibility, just like the White Sharks. Anyway, we had a great dive on the Rock and in the adjacent kelp bed. A nice relaxing paddle back to a shore discussing the dive and possible future dives. After loading up the kayaks and dive gear off for some shrimp burritos at El Charro. Sun was starting to peak through the marine layer for a nice meal in the sun watching the tourist kayakers walking down to the beach.